Able Tree Care provides Manhattan tree services in Manhattan ZIP Code 10004. Call us when looking for the top tree service experts or a 10004 Tree Service Company. If you need tree service or tree care in Manhattan ZIP code 10004 then please call our local Manhattan tree experts. This is part of our service area coverage in Manhattan and we serve many 10004 property owners currently. Our local tree company provides emergency tree inspection and tree care service in Manhattan. 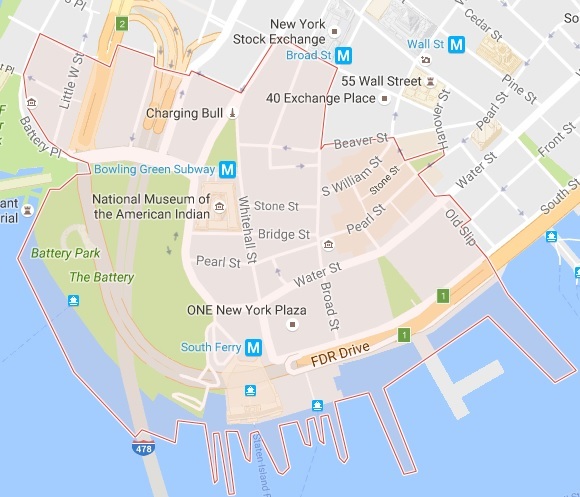 ZIP code 10004 – Home to Battery Park, New York Vietnam Veterans Memorial Plaza, and Bowling Green, of the famous Charging Bull. This ZIP code contains the lowest areas of Manhattan with the Hudson River on one side and the East River on the other. ZIP code 10004 is also where you will find the gateway to Brooklyn via the Brooklyn-Battery Tunnel. This is a congestive area that contains large amounts of people traveling the walk ways and streets every day. When a tree needs to be cut, or when there is a tree removal project in lower Manhattan, Able Tree Care is called in for the job! Many local tree companies in Manhattan do not have the experience or the manpower to handle large, dangerous tree projects. At Able Tree Care we own, never rent our heavy equipment which means we never have to wait for rental equipment to become available. We are the top tree company in Manhattan and we will prove it to you with our customer care and expert tree service every time. Property owners rely on us for all of their tree care needs, and the City of NY turns to Able Tree Care when they hire tree companies to care for or remove NYC trees. When you are looking for the #1 10004 tree service and want to hire the best Manhattan tree company that provides safe and affordable tree services, which includes tree removal and tree cutting, then please give Able Tree Care a call now. We provide 24/7 tree service in Manhattan.